Reverend Bhagya Jayavanii Bbhikkhuni was born in Parit Buntar in thestate of Perak , Malaysia to a Hindu family; the eldest of 7 children. She had a very strict upbringing as her father was a man of strict conduct and discipline. She was married off at the early age of 17, and once again encountered a strict family life, having to obey her husband and mother-in-law’s every command without having much say in her own life. She lived in constant fear of her husband and mother-in-law and longed to be free. She constantly thought of the purpose of life. Deep inside her heart and mind, she knew she had a calling to lead a holy life. As time passed, her inclination towards meditation and religious activities grew. One day, Reverend Bhagya Jayavanii Bhikkhuni had a realization that life is impermanent and knew that she would one day renounce. However, she patiently and dutifully discharged her duties as a loyal wife and mother of three children (now 28, 26 & 25, a clerk, a nurse, and an accountant in Ireland respectively), and waited for the right time to renounce, even though she was spiritually ready. Then, on May 8, 2000 , Reverend Bhagya finally left her home and head for the capital city of Kuala Lumpur . Her children were all grown up and she was finally able to answer her calling. In Kuala Lumpur , she got a job as a child-minder at the Ti-Ratana Buddhist Orphanage. After serving for a year and observing 8 precepts, Reverend Bhagya Jayavanii decided to renounce. Which the help of the Vice-President of Ti-Ratana Buddhist orphanage, Mr.Tan Thim Huat, and a Bhikkhuni residing in Thailand, Bhikkhuni Dr. Lee, and other well-wishers, she left for Sri Lanka in 2001. She ordained as a Samaneri on 30th December 2001 at the Golden Temple in Dambulla, wirh Sri Sumanggala Maha Thero, the Abbot of the Golden Temple . Shortly thereafter, on the 3rd and 4th of March 2002, she received higher ordination as a Bhikkhuni at Mt. Lavinia, Colombo, Sri Lanka by Venerable Royal Pundit Talake Dhammaloka Anunayaka Thero, thus becoming the first Bhikkhuni of the Theravada tradition from Malaysia. 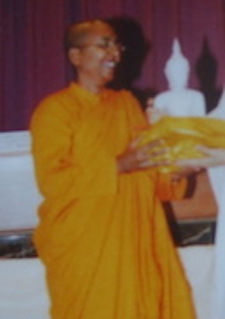 Reverend Bhagya Jayavanii Bhikkhuni returned to Malaysia in June 2002, and established her own Children’s Home. Her aim in life is to serve and help the needy around the world, to be The Mother of All Children.